How do I get those cute little pictures next to my comment? Have you noticed that when some people comment, they get a little picture of themselves next to it? Basically, these guys provide a service that sends back your pretty little picture, so that people everywhere can know that it really is Geoff Matheson posting a comment on their blog because nobody else would possibly pretend to look like that. 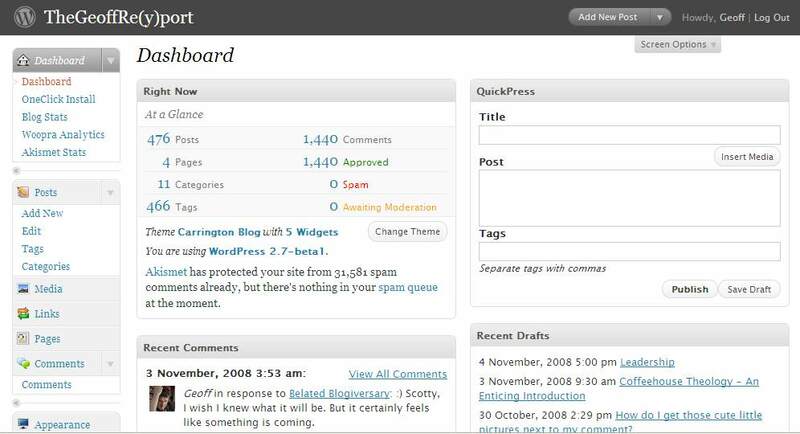 And Gravatar got bought out by Automattic who run WordPress.com, so once you sign up for a Gravatar, you’ll see it popping up next to your comments all over the web. So go do that today! There’s a plane in the Hudson. I’m on the ferry going to pick… on TwitPic. The above comment was posted along with the picture linked on Twitter, only moments after the (now famous) plane landed in the Hudson River in New York. This is why citizen journalism on the web, and twitter (combined with camera-phone integration) is freaking awesome. This is how news gets broken in 2009. And how cool is the picture! 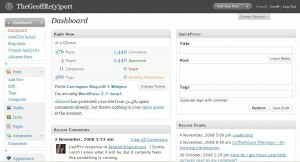 Now a better blogger would play around with themes and stuff on a test blog. But not me. So I’m playing around with a new theme on the live site. Hopefully you’ll cope. This is freaking cool. Search the Google Index as per January 2001. The results link off to the internet archive, so you can even see what the sites looked like. It’s pretty awesome. Nostalgia never felt so nerdy. Google's new browser - "Chrome"
Freaking fast – I’ve said it already but this canes the buttocks off either of the big two browsers just in terms of speed. It’s Google – and they make good stuff. The big positive about Google is that they have a philosophy of “release early then iterate”, meaning that the failures of today will likely not be there tomorrow. No RSS Support – now I realise that this might not mean a lot for some of you, but there are a bunch of us that this will raise alarm bells for. Not only do you not get the cute little feed icon showing up in the address bar of a relevant site, but if you click on an RSS feed link, you just get garbled junk. No extensions – For a long time Firefox user, this is a bit of a sad one. Extensions are pluggable bits of code that magically do fun (or useful) things to your browser to add functionality. At this stage there’s nothing like that for Chrome, and while I think that’ll change, for the moment that’s a deal killer. It’s only on Windows at the moment, which means people who have a choice about their OS are unlikely to be able to use it yet. You might still be stuck in the Internet Explorer world where you didn’t realise you had a “web browser” other than the big blue e.
So for the moment, it won’t be my primary browser of choice. Although I could actually imagine that if I was doing anything significant in Google Docs for example, I’d be a fair chance to fire this one up. The real key will be seeing how Google continue to develop this one, and whether the reasons not to use it really do disappear overnight. I must admit that I do feel like a bit of a sell-out having bought an iPod touch, aka: the phone planless man’s iPhone. But a combination of seeing a shiny new iPhone in the wild and having already decided that I didn’t have enough justification for getting an iPhone, plus apple having a good deal going on refurbished iPod touches led to a moment of weakness that I’m having a hard time trying to regret. The ongoing wait for home Internet has meant that I’ve had this little beauty since Monday but haven’t had it all updated until last night. And with all the funky apps that you can pick up that’s when she really comes alive. Apart from anything else this post will have been completely written in the wordpress app, which has been remarkably well designed. Like a massive chunk of the iPhone apps, it just does what you expect it to, in the way you expect it to work. Suffice to say my train trips just got a whole lot more bearable. China’s booming Internet population has surpassed the United States to become the world’s biggest, with 253 million people online despite government controls on Web use, according to government data reported Friday. China steals internet crown from US – web – Technology – theage.com.au. This is made more impressive by the fact that the internet addressing system currently doesn’t even really cater for chinese characters, and that the Chinese are only able to see parts of the internet that don’t cast their illustrious government in a negative light. Twitter – To tweet or not to tweet? Haven’t quite resolved the big question posed in the title there at this stage, but for the moment I’m giving Twitter a fair dinkum go. It’s taken me a fair while to work out whether or not I really care about Twitter – but after having had fun playing around with Instant Messaging and Facebook status messages for a while, I figured it’s my new chance to be hilariously funny on a micro-type level. So for the time being (at least) feel free to subscribe to my Twitter RSS, or just check out my Twitter page. You might also have noticed the “Geoff is currently” widget on the right hand side, which is obviously being fed by twitter too. Anyone else using Twitter? Good? Bad? Indifferent? I’d be interested to know.